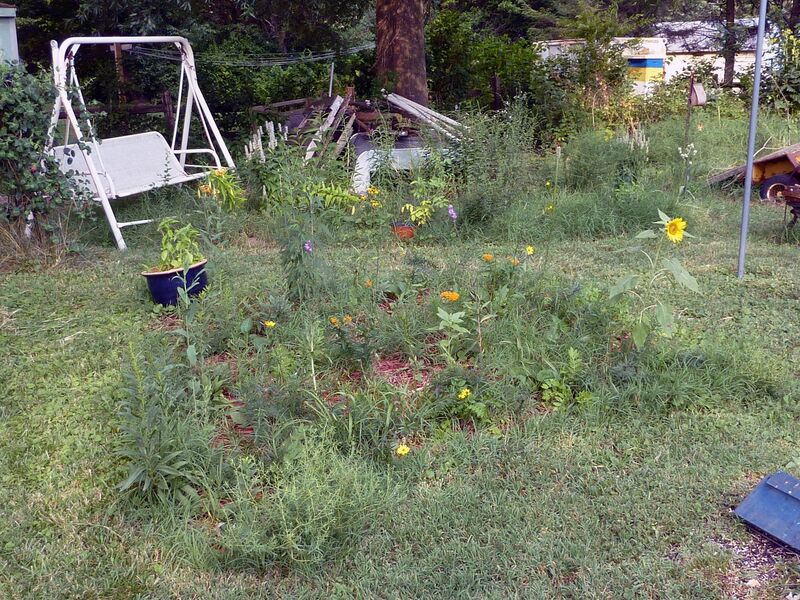 Alright I've spend enough posts about other gardens, how's my prairie project going? It's at least colorful looking minus all the clutter laying around. It's weird nice I think my yard looks in person. There's something about posting photos of it on the internet for all to see that really brings out the clutter. Here it is from another angle. One of the species of Coreopsis has gone completely dormant/dead. All of the Western Spiderwort seems to be dying back after they flowered. The milkweed is doing great, they have flowers and are sending up even more shoots, with at least 3 or 4 of the 12 plants flowering at any given time. Next year everything should go extremely well. I've since been transplanting some Liatris into the garden from elsewhere in the garden. I find Liatris to be neat as they don't have much of a root structure but moving them triggers flowering to start immediately. 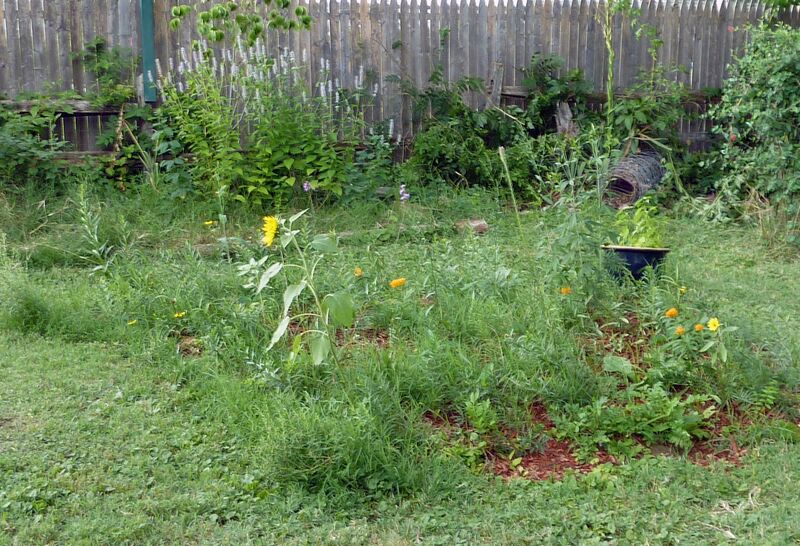 There's a nice patch of Black Eyed Susan in the older prairie garden next to the tree. They're as mutated as ever naturally. 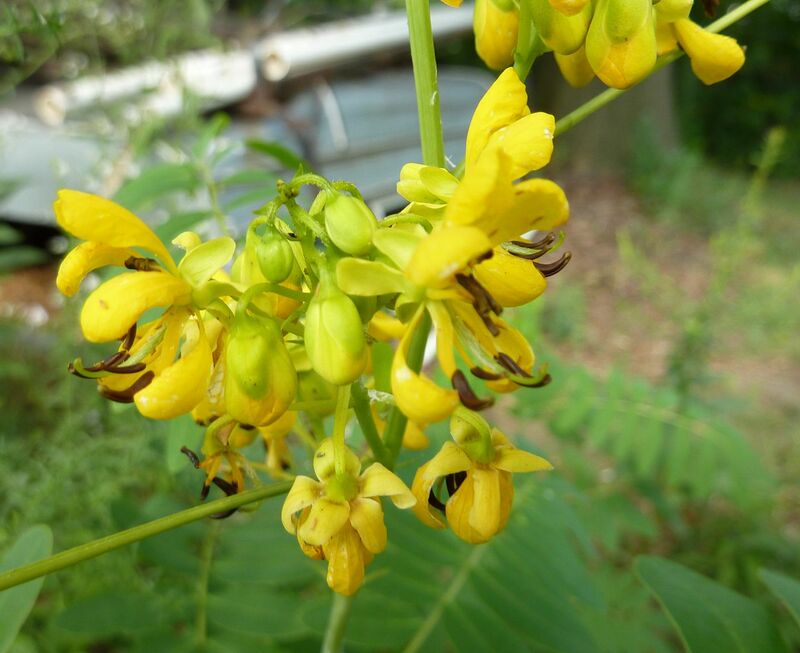 Cassia hebecarpa, Wild Senna, has started flowering. This is a host plant to the Cloudless Sulphur Butterfly, Phoebis sennae with emphasis on the flowers and seed pods. Leaves are mostly a secondary option for caterpillar consumption. I'd like to plant more of this as the butterfly is quite nice looking. And speaking of butterflies I've attracted to the yard. 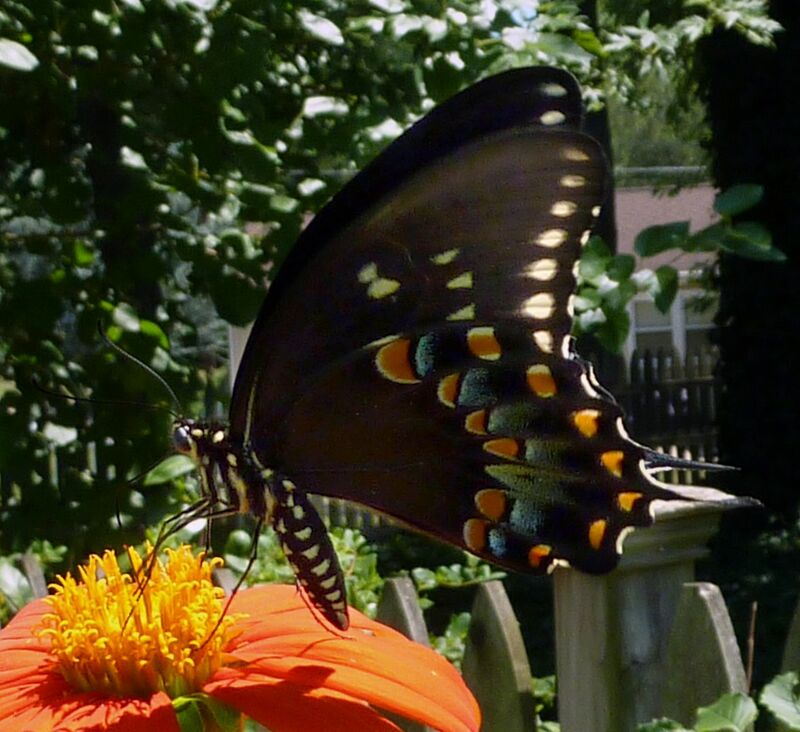 Here is either the Spicebush Swallowtail or Black Swallowtail. I have a spicebush but it's very tiny. I have lots of things in the carrot family about which are what black swallowtails love. I'm not certain which this is but I found a picture of a spicebush swallowtail that matches this one perfectly and that's what I'm siding with. It's a shame I don't have a more suitable host plant for it though. 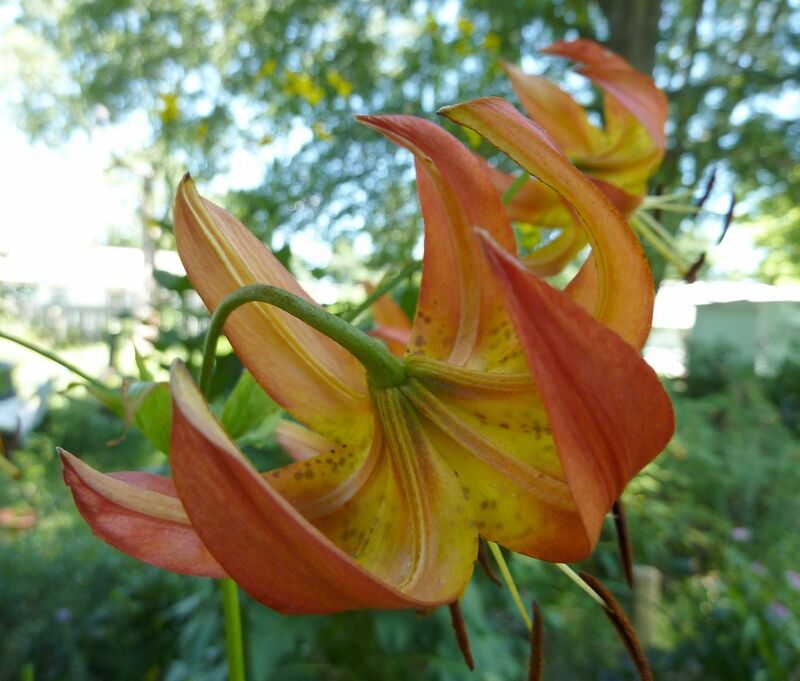 Lilium superbum, Turks Cap Lily, started flowering elsewhere in the garden. 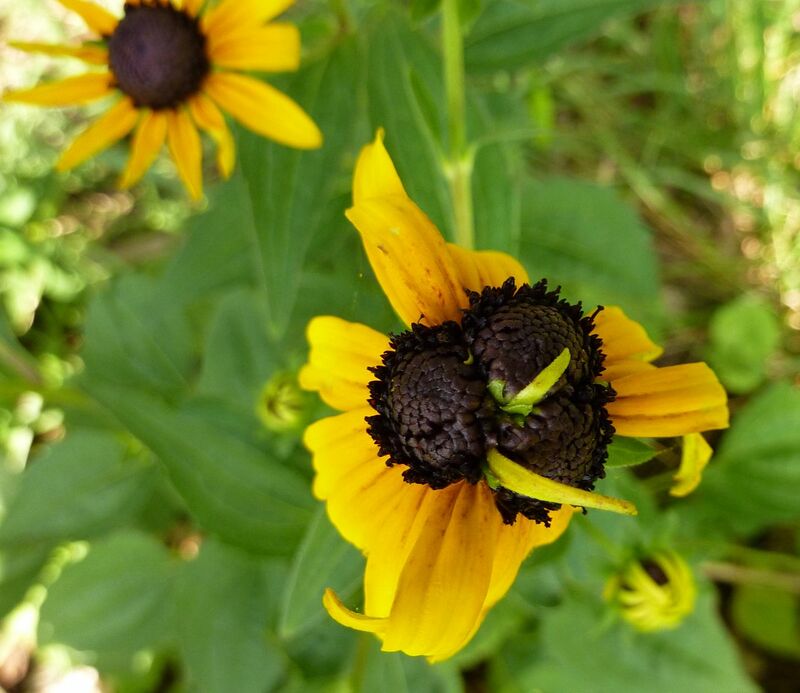 I have a cultivar of this in the prairie garden but frankly it looks as effed up looking as that black eyed susan flower. 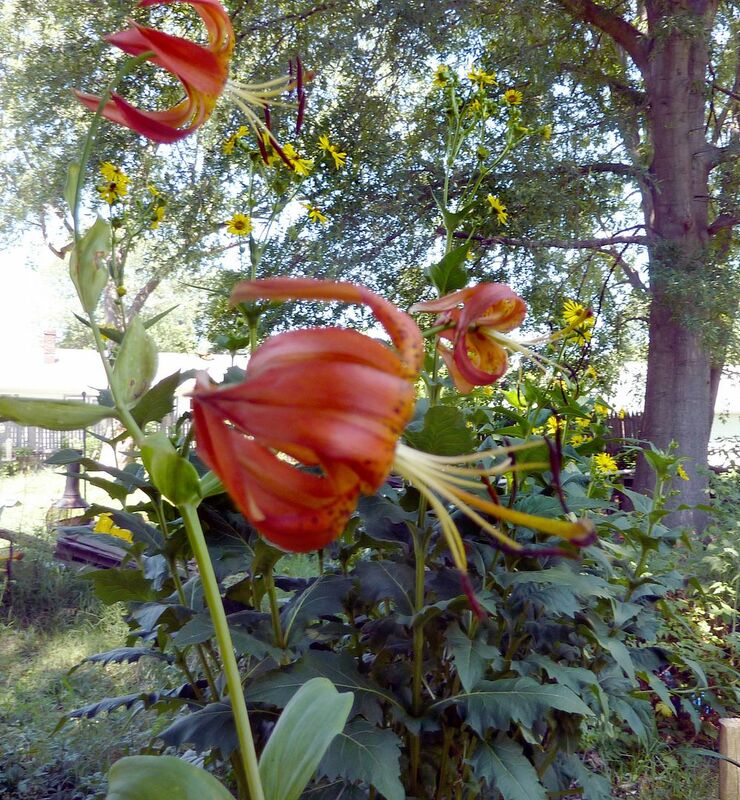 Not sure who thought the thing was pretty enough to cultivate, as the true species lacks random growths and tendril-like flaky structures on the flower. While the wind was blowing one day I realized how perfect a companion they are to the cup plant. Both are almost as tall as one another, the flower color goes great, they're different enough to not be redundant, everything sounds perfect. I will certainly be planting some bulbs around this fall. I love your prairie. And that's very, very interesting about what happens when you move liatris -- I'll have to try it. I have three healthy liatris plants in a side yard. Early in the season my deer ate off the tops of one plant (liatris is supposed to be deer-resistant, but my deer, probably the fawns, need to learn that lesson fresh each year). I was annoyed of course but now that particular plant is actually doing better than the other two: it seemed to like having a haircut. And what a beautiful butterfly! I always learn something new when I come to your blog.